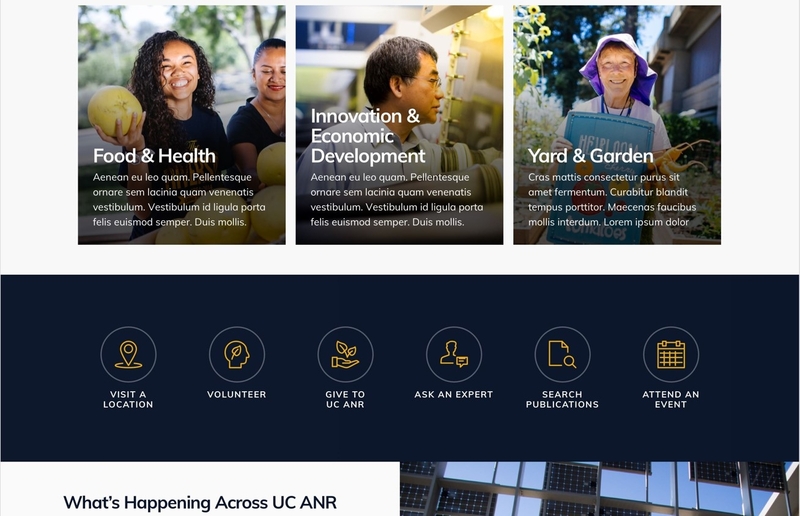 UC ANR programs greatly impact the lives of Californians, in every corner of the state. It is challenging, however, to communicate all the Division's varied efforts to the diverse communities we support. The ANR website is crucial to our public outreach and the CSIT team works every day to build and secure our online presence. Our goal is to make sure ANR communicates successfully today while also preparing ourselves for the technical challenges of reaching our audiences tomorrow. Over the last few months, CSIT has worked with an outside digital agency and representatives from across ANR to re-design the UCANR.EDU website. 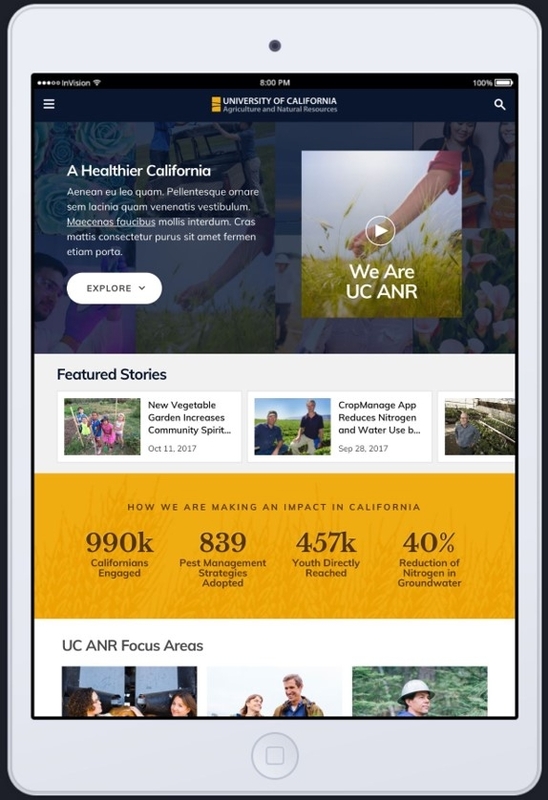 Focusing on the widely different communications requirements at ANR, the new site applies a modernized design philosophy embracing strong visual content and a polished style appropriate for both mobile and desktop devices. 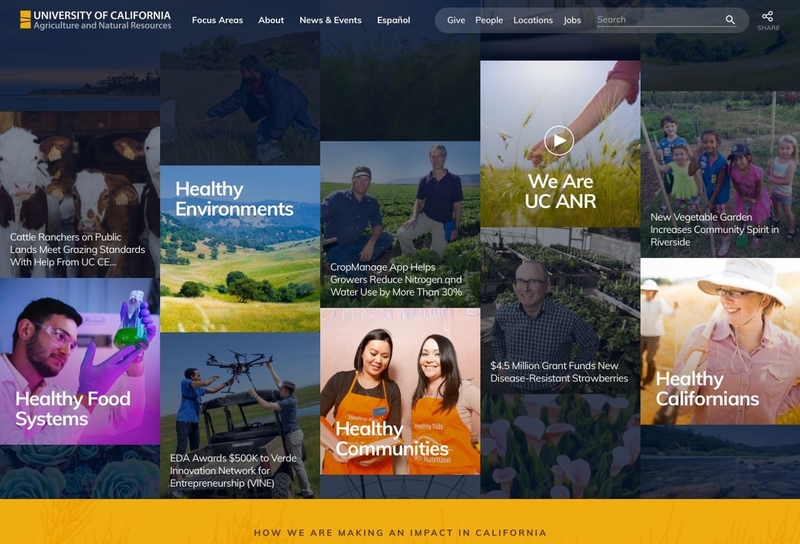 In contrast to the existing design, the new ANR homepage will strongly highlight the division's mission statement and emphasize real-time news and data. Building on current web development research, the new site employs a simple and user-friendly form of interactivity that is consistent with best practices in usability, engagement and accessibility. We plan to deploy the new design on the ANR homepage later this year, with a gradual rollout to the rest of the division in the following months. Underneath the new look and functionality, the site continues to employ ANR's homegrown SiteBuilder technology in order to make the transition as seamless as possible. Once the homepage is up and running, the new features and design elements will become available for deployment on all ANR SiteBuilder sites. There will be training and support resources available to assist ANR users wishing to refresh their sites as well. 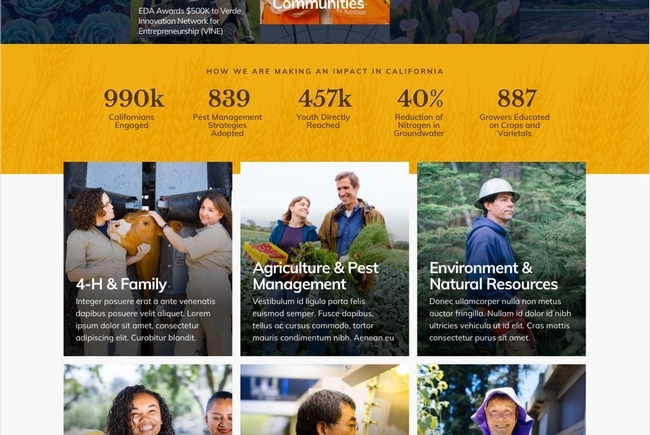 The re-design does offer an excellent opportunity to re-vitalize our web properties across ANR and message widely the crucial role ANR plays in state and local communities. Keep an eye out for announcements on exact timing in the coming weeks.